Picture - XH558 performs its display at Cosford Airshow 2009. Avro Vulcan XH558 (civil aircraft registration G-VLCN) The Spirit Of Great Britain is the only airworthy example of the 134 Avro Vulcan V-bombers that were operated by the Royal Air Force from 1953 until 1984. Vulcan XH558 served with the RAF between 1960 and 1985 in the bomber, maritime reconnaissance and air-to-air refuelling roles. The RAF operated XH558 as a display aircraft from 1986 until 1992, when budget cuts forced its retirement. XH558 was the twelfth Vulcan B2 built, first flew in 1960, and was delivered to No. 230 Operational Conversion Unit RAF at RAF Waddington on 1 July 1960. Almost immediately the aircraft moved with 230 OCU to RAF Finningley where the aircraft spent some eight years before returning to Lincolnshire in 1968. Most of its operational service was with the units of the Waddington Wing including No. 50 Squadron RAF. The aircraft was converted to a B2 Maritime Radar Reconnaissance in 1973 and subsequently to the air-to-air refuelling variant K2 in 1982. It was returned to standard B2 configuration in 1985 and was the last Vulcan in service. From 1986 to 1992, it was the RAF's display aircraft. After service with the Royal Air Force, the aircraft was sold to C.Walton Limited and delivered by air to Bruntingthorpe on the 23 March 1993. The aircraft was kept in a serviceable condition and would undertake fast taxi runs along Bruntingthorpe's main runway. The engineering staff of the Vulcan Operating Company (the engineering arm of Vulcan to the Sky Trust, owners of XH558) worked to return Vulcan XH558 to flight, with the first test flight taking place 18 October 2007. They were supported by the "Vulcan to the Sky" club, a supporters and fundraising organisation. 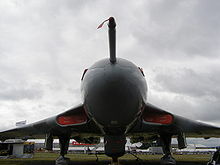 Though the website carried an announcement on 1 August 2006 that the project was in danger of being abandoned due to lack of finance, the target of raising the remaining �1.2m was achieved on 31 August 2006, thanks to a high-profile publicity campaign orchestrated by the supporters club, Vulcan to the Sky Club (formerly Vulcan 558 Club). Time had almost run out for XH558 when Sir Jack Hayward, a British philanthropist, donated �500,000, which topped off the �860,000 already raised by Vulcan to the Sky Club and Friends. Although the aircraft restoration was nearly complete, the aircraft was not ready for the flypast down the Mall in London for the 25th Anniversary of the Falklands conflict on 17 June 2007 or the RAF Waddington Airshow and the Royal International Air Tattoo (RIAT). 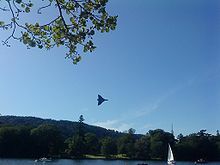 It was originally intended for the Vulcan to fly during at least one UK airshow during the 2007 season. but due to delays in returning the aircraft to flight, mainly down to delays in the return of refurbished flight-critical components, the aircraft was not ready for the display season. On 16 August 2007, the aircraft started engine testing on the airfield at Bruntingthorpe. On the next day, XH558's No.3 Rolls-Royce Olympus 202 jet engine was run for the first time in over 20 years. This is a different engine from that used by XH558 during its final season with the RAF's Vulcan Display Flight in 1992, with all four of the Vulcan's original Olympus 202 engines having been replaced by zero-hour units which had been stored since 1982. The VTS Team also has another four fully inhibited engines in stock. The removed engines were either scrapped, sectioned for display or passed on to VRT's XL426 at Southend. Another milestone in the restoration project was achieved on 22 August 2007, when all four of XH558's Olympus engines were run at nearly full power settings, for short intervals. The first post-restoration flight, which lasted 34 minutes, took place on 18 October 2007. On 14 April 2008, the Vulcan flew from Bruntingthorpe to RAF Cottesmore to have a Compass swing and test flights. Whilst in mid air the plane called Mayday after believing the Auxiliary power unit (APU) was on fire. It landed safely at Cottesmore and the cause was later discovered to be an electrical fault. On 16 April, a further two-hour test flight was planned to perform "straight line testing" of avionics. The flight was scheduled to go between Cambridge and Marham, but this was abandoned when one of XH558's undercarriage doors failed to close due to an electrical micro-switch malfunction and the aircraft made a safe return to Bruntingthorpe Airfield. During part of May 2008, XH558 resided at RAF Coningsby where it underwent further testing, and while there took part in a photo-call with the Lancaster and a Typhoon . On 9 June 2008, XH558 flew its final test flight and was granted on 3 July, by the CAA, its Permit to Fly at 1605. At 1705, it launched for RAF Waddington where it flew its airshow routine, in front of CAA examiners who then issued its DA (Display Authorisation) for the RAF Waddington airshow in the first week of July. The medium-term aim of the Trust is for XH558 to fly down The Mall on 4 June 2012 in celebration of the Queen's Diamond Jubilee. The longer-term aim is to make the authorised modifications that will allow fatigue life to match expected engine life, with both expiring at about the same time in the period 2013 to 2015, depending on Fatigue Index usage and engine cycle usage. As the aircraft currently operates under Visual Flight Rules (VFR), it cannot fly IFR in cloud to clear higher altitudes where there turbulence is lower. Flying VFR in lower often turbulent air adds to airframe fatigue and this increases fatigue-index (FI) consumption. In 2010 the aircraft will be limited to between 30 and 40 hours flight-time, to help reduce FI usage and thus preserve the airframe. As a result, the number of air show appearances will be fewer than in 2009. Some two-day fly-in shows may be limited to just one appearance, with the first day being given preference to allow the second day to act as a reserve in case of technical or weather difficulties. Scheduled appearances for the 2010 season, subject to weather and serviceability, provisional events subject to confirmation. On 9 September 2008, the Chief Executive of the Vulcan To The Sky Trust, Dr Robert Pleming, announced on XH558's site that there were serious shortfalls in the aircraft's funds suggesting that "...it looks as if the door may now be closing on the future of the Vulcan in flight. I think that anyone wishing to see a Vulcan in flight should do so as soon as possible." and that "If we don’t achieve a significant change of circumstances soon, we won’t be able to carry out our role of ‘Honouring the Past, Inspiring the Future’, providing the once-seen, never-forgotten sight of XH558 in flight to a new generation; stimulating interest in design and engineering; and telling people about an important period in our nation’s history". XH558 still has no commercial sponsors and relies on public donations and fundraising events organised by the Vulcan To The Sky Club members and supporters. In December 2008, the Vulcan To The Sky Trust set up a pledge scheme to raise �1 million by early 2009 to pay debts and cover servicing and operating costs for the 2009 display season. On March 6 the appeal reached its target. To fund maintenance work on XH558 that had to be brought forward from 2011, the Vulcan To The Sky Trust conducted a fresh campaign to raise further donations from the public. The Vulcan 50th Birthday appeal sought to raise an additional �800,000 ($1,280,000) by the end of March 2010, of which �500,000 ($800,000) was needed by the end of February 2010 to enable work to begin. On 24 February more than �400,000 was donated by an anonymous benefactor, passing the "survival level" target for necessary engineering maintenance to begin. The VTST continues to run its 50th Anniversary Appeal for donations with the aim of building a sizeable cushion of additional donations as a prudent contingency. In the absence of a major ongoing sponsor, the Trust now aims to keep raising funds from public donations year-round. Avro Vulcan XM655, the only other taxiable Vulcan. Avro Vulcan XH558 Pictures and Avro Vulcan XH558 for Sale.